ETAGEN’s Therapeutic Editing™ oligomers specifically bind to and permanently correct disease-causing nucleic acid sequence variants in tissues. We employ chemically-modified DNA oligomers (ETAMERS™) that act as both the guide and template for triggering precise editing by the endogenous DNA repair machinery, addressing the need for a more simple and specific editing platform for in vivo therapeutic applications. ETAMERS create precise repairs without causing undesired insertions and deletions. ETAGEN Pharma was founded in 2014 by leaders in Therapeutic Editing™ Dr. Tod Woolf and Dr. Richard Hogrefe. ETAGEN’s goal is to correct disease by selectively editing out mutated sequences and to prevent disease by editing in protective genomic variants in tissues. 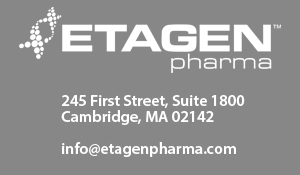 ETAGEN is headquartered in Massachusetts, with chemical synthesis performed by TriLink Biotechnologies in San Diego, California. Dr. Woolf co-authored the first article using the term Therapeutic Editing™ and demonstrating efficient Therapeutic Editing in a model cellular system in 1995. Dr. Woolf has developed and commercialized innovative biomedical platforms and products employed throughout the biopharmaceutical industry including mRNA Therapeutics™, Stealth™ RNAi, Self-Delivering rxRNA™ and Next Generation Antisense™. Dr. Woolf completed his Ph.D. thesis in Professor Doug Melton’s laboratory at Harvard University. He co-founded and served as CEO at Sequitur (acquired by Life Technologies) and co-founded RXi Pharmaceuticals with Prof. Craig Mello. His teams have raised over $50M in equity financing and generated over $50M in non-dilutive revenues through alliances, grants and research product sales. Peggy Romero has served as an advisor establishing business and technical operations at successful start-up biotechnology companies including Karyopharm Therapeutics and Verastem. Ms. Romero served as Director of Operations at Sirtris for six years through its acquisition by GlaxoSmithKline. Previously she was a scientist and manager of laboratory operations for eleven years at Mitotix-GPC Biotech. Amy Tata has performed accounting and worked on financial operations at a wide range of firms from startups to Fortune 500 companies. She was Treasurer, Controller, and Principal Accounting Officer at RXi Pharmaceuticals Corporation. In this role she established financial operations and administered the company’s accounting and SEC Reporting. In 2012, she helped bring the RXi public and implemented controls and procedures for compliance with Sarbanes-Oxley. She previously served as an Audit Coordinator at State Street Bank and Grant Thorton. Dr. Hogrefe is the CEO of TriLink Biotechnologies, a leading manufacturer of nucleic acid reagents and therapeutics that he co-founded 18 years ago. Dr. Hogrefe performed his graduate work with Prof. Robert Letsinger, the originator of solid support DNA synthesis chemistry. His academic and industrial career has focused on the synthesis of challenging RNA and DNA drugs and probes. He is author of over 40 patents and research articles, and has served on the editorial board of the journal Oligonucleotides. Dr. Hogrefe’s team at TriLink has provided synthetic support to virtually every major player in oligonucleotide therapeutics. Dr. Kmiec founded and directs the Gene Editing Institute at the Helen F Graham Cancer Center and Research Institute in Newark, Delaware and is a Professor at the University of Delaware. He has also served as Director of the Laboratory of Applied Genomics at the Delaware Biotechnology Institute. His lab was the first to achieve genome editing in mammalian cells with oligonucleotides and he has co-authored over 30 patents and 140 research articles in the genome editing field. Prof. Boyce has an appointment at Harvard University with a laboratory at Massachusetts General Hospital. He received his BS from MIT and his MD/Ph.D. from the University of Michigan. He is an expert on gene therapy and genetic diseases and he has served as an advisor to numerous biotechnology companies. Dr. Boyce cloned the dystrophin brain promoter and performed early work with truncated forms of active dystrophin for gene therapy. Prof. Boyce created a baculovirus expression system for mammalian cells that has been broadly commercialized. Dr. McSwiggen is an expert in translational nucleic acid therapeutics and bioinformatics and serves as the CEO of the RNA Society. He is a co-inventor on hundreds of patents and patent applications and was the lead inventor on the “McSwiggen” patent that forms the basis of Alnylam’s 3rd Generation Chemistry. He formerly served as a Research Scientist at RaNA, Quark and SIRNA Merck. Dr. McSwiggen completed his post-doctoral fellowship in the laboratory of Nobel Prize winner Prof. Thomas Cech. Therapeutic Editing™: A Powerful Approach to Treating and Curing Diseases. ETAGEN is partnering with biopharmaceutical companies and disease foundations to create ETAMER™ leads for multiple indications. Woolf, TM. Therapeutic Repair of Mutated Nucleic Acid Sequences. Nature Biotechnology, Vol 16:341-344, 1998. (review of earliest therapeutic editing work and generalizing the concept of genome editing by strand-invasion). Woolf, TM. It’s Not the Size, It’s the Potency. Nature Biotechnology, August 1996, 14, 824, 1998. (invited commentary on the seminal paper of Richard Wagner et al. demonstrating efficient delivery of “naked” chemically modified antisense oligonucleotides to cells in vitro). An article about ETAGEN was published in the March 31, 2016 edition of BioCentury. See article HERE. June 29, 2016. ETAGEN will be presenting of a talk entitled: “Optimizing Oligonucleotide Mediated Editing” at private invitation only conference sponsored by a rare disease foundation. May 17, 2016. ETAGEN CEO Tod Woolf will participate on panel discussion entitled “The Cutting/Editing Edge” beginning at noon. Piper Jaffray GenomeRx Symposium, The InterContinental New York Barclay, 111 East 48th Street, New York, NY 10017. May 4-5, 2016. ETAGEN CEO Tod Woolf to present a keynote address talk entitled, Cleaving, Expressing and Repairing Nucleic Acids for Therapeutic Applications at the 13th International RNAi/MicroRNAs/Stem Cells & Genome Editing-2016 Boston Meeting. February 18, 2016. ETAGEN Advisor, Prof. Eric Kmiec, to present a Keynote address entitled, An Historical Perspective on the Development and Principles of Gene Editing Technologies and ETAGEN CEO Tod Woolf to present a talk entitled, Introduction to Genome Editing and Engineering at the Genome Editing & Engineering Conference in San Diego, CA. June 16, 2015. BIO International Convention partnering conference in Philadelphia. ETAGEN CEO Tod Woolf gave a presentation entitled, “Genome Editing with Chemically Modified Oligonucleotides” at 10:30 a.m.
All rights reserved. All images and copy are proprietary and cannot be used without consent.